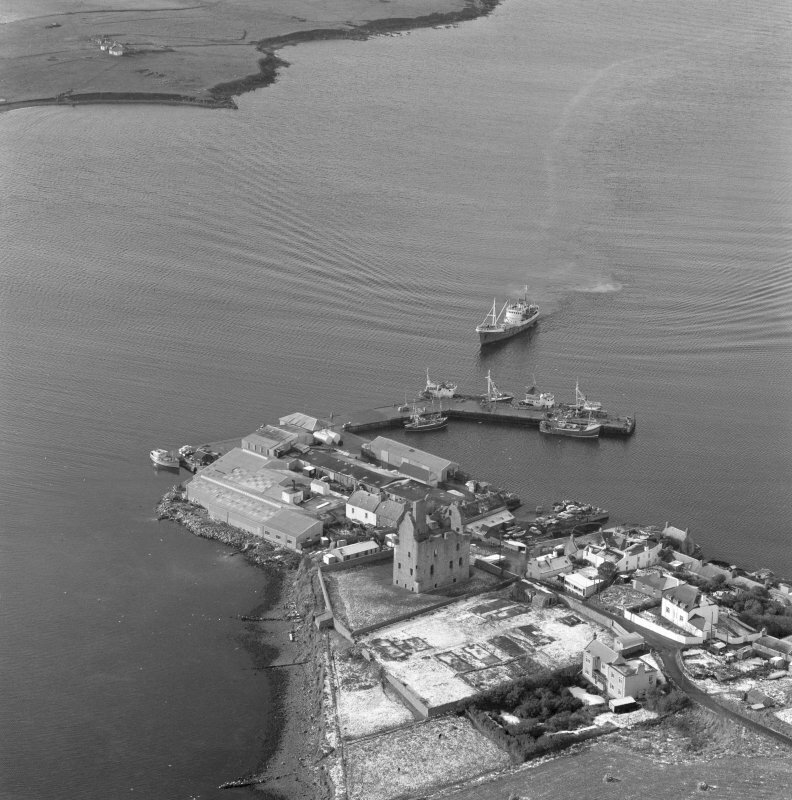 Oblique aerial view centred on Scalloway Castle. 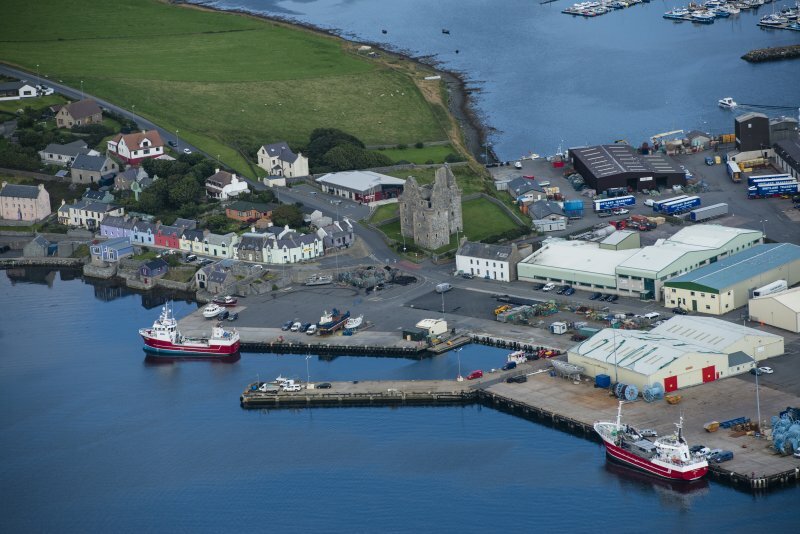 Oblique aerial view of Scalloway town and castle. Detail of gable and corbelled staircase. 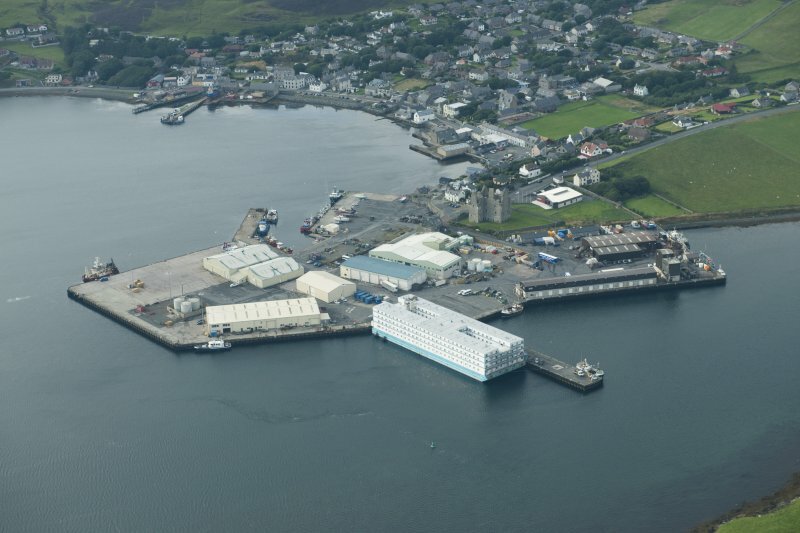 Oblique aerial view of Scalloway Harbour and castle, looking NW. 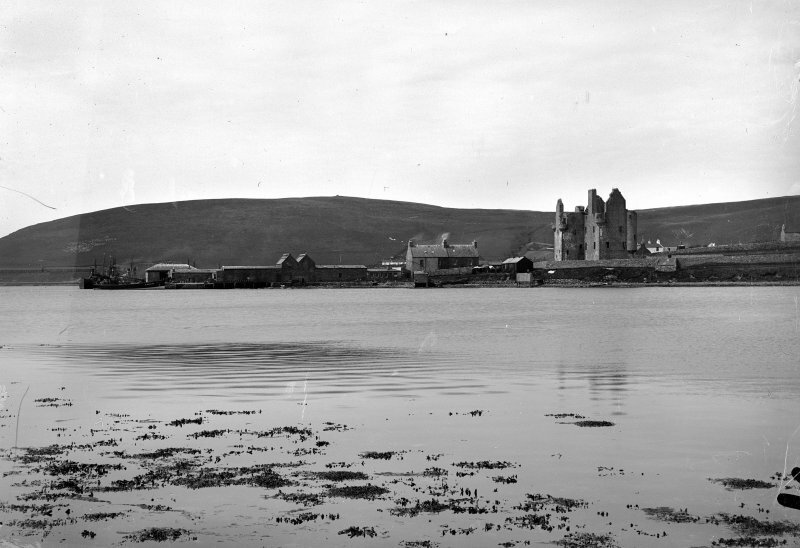 Historic photograph showing Scalloway Castle. 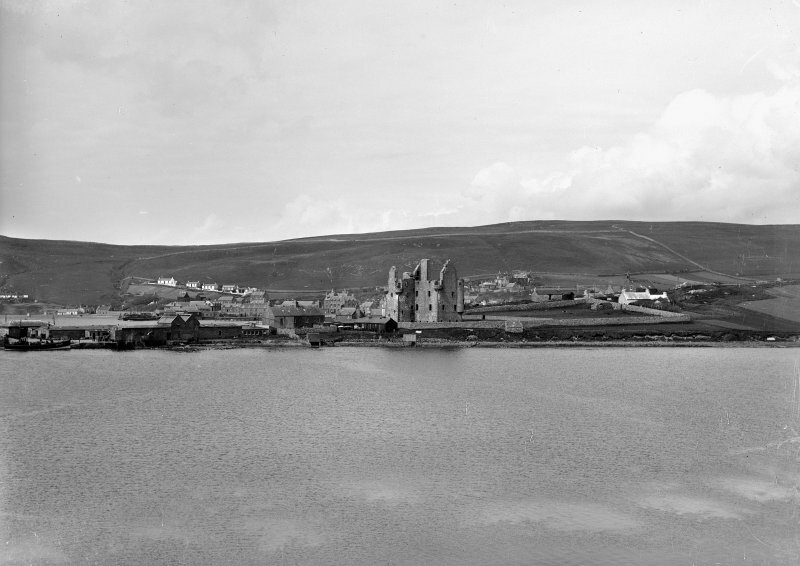 (HU 4043 3922) Scalloway Castle (NR) (In Ruins). 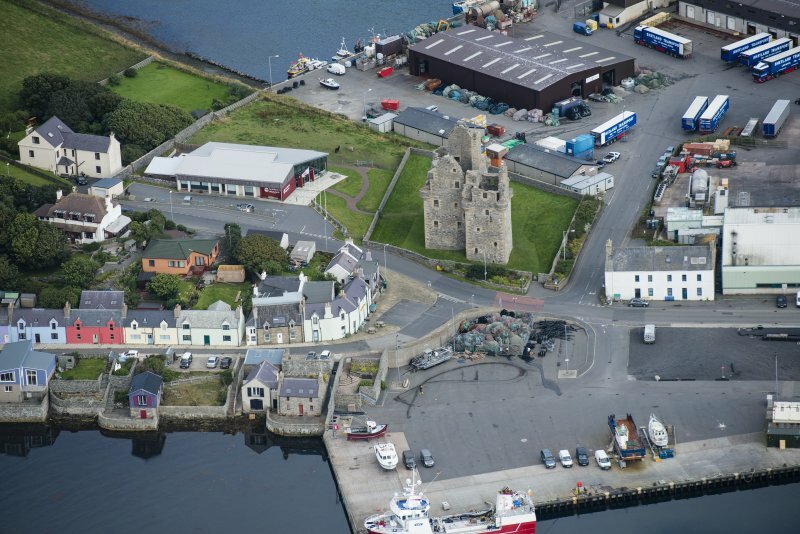 Scalloway Castle was built in 1600 and comprises an oblong block 58ft 6ins (17.83m) from E to W by 33ft 9ins (10.3m) from N to S, with a wing attached to its SW corner, 26ft 3ins (8m) by 26ft (7.92m). 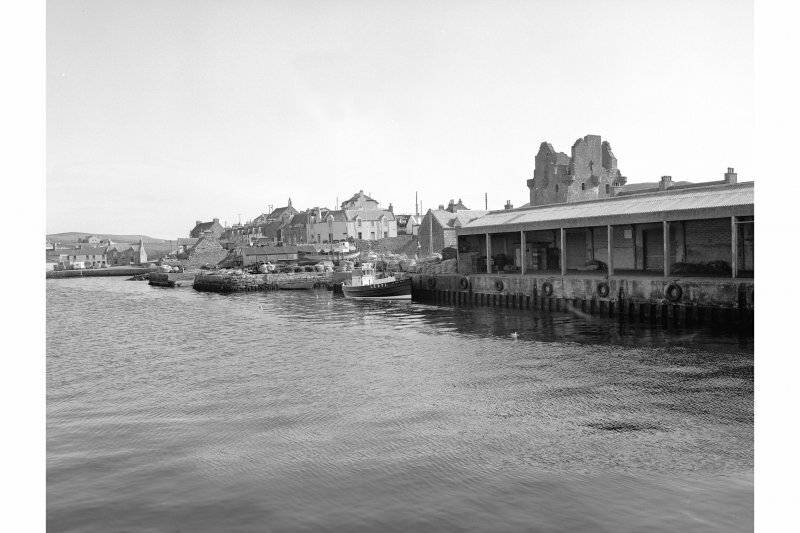 The remains, four storeys and a garret in height, rise almost to the wall-head and are in the care of the M of Public Buildings and Works. 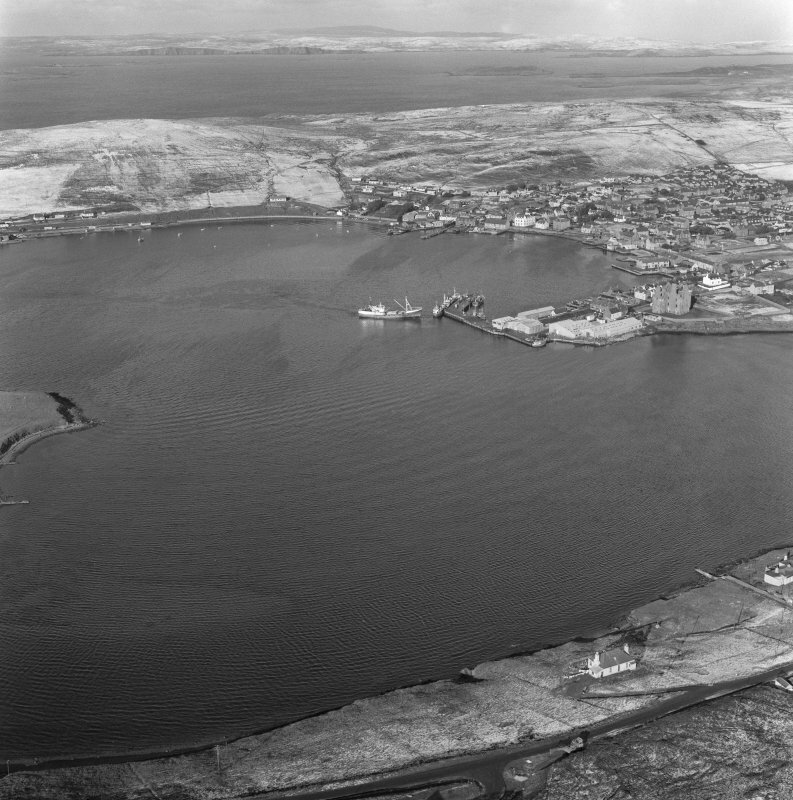 RCAHMS 1946; B H St J O'Neil 1950. 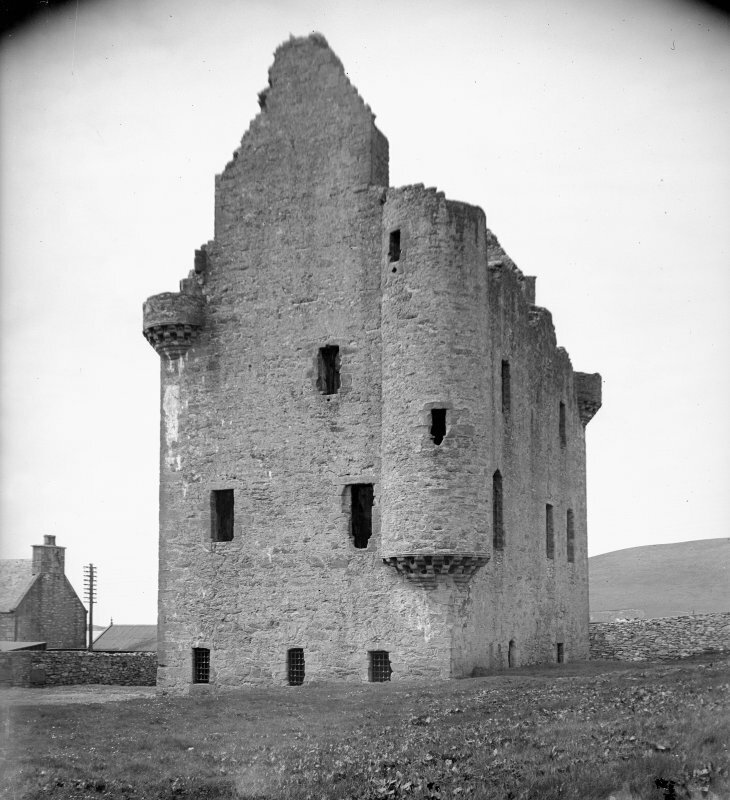 Scalloway Castle is as described and illustrated by the RCAHMS. 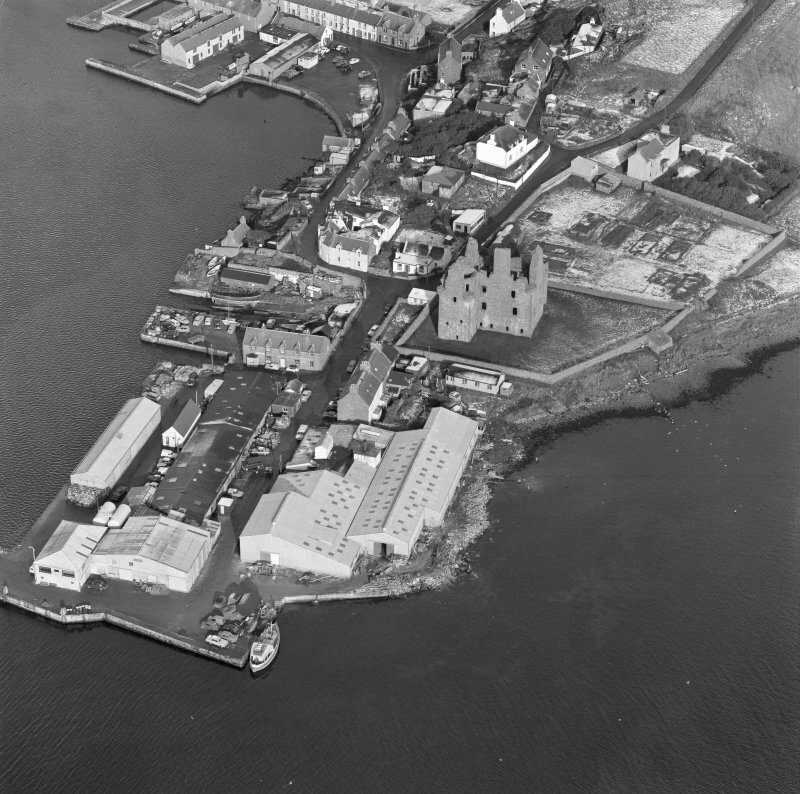 Visited OS (NKB) 16th May 1968. 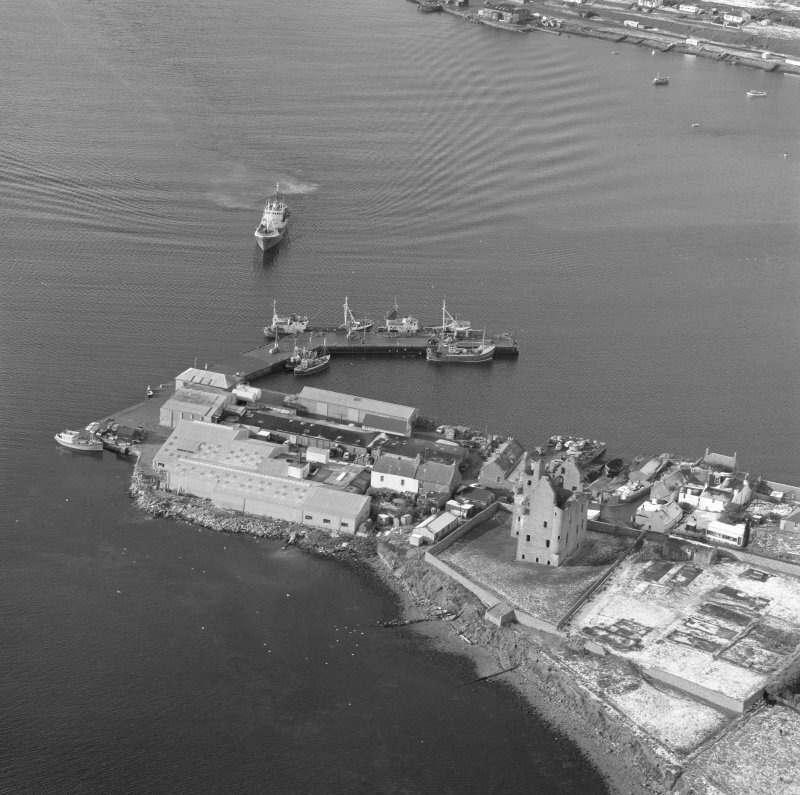 Oblique aerial photographs of Scalloway Castle, Shetland Islands, taken by Mr John Dewar in 1971. 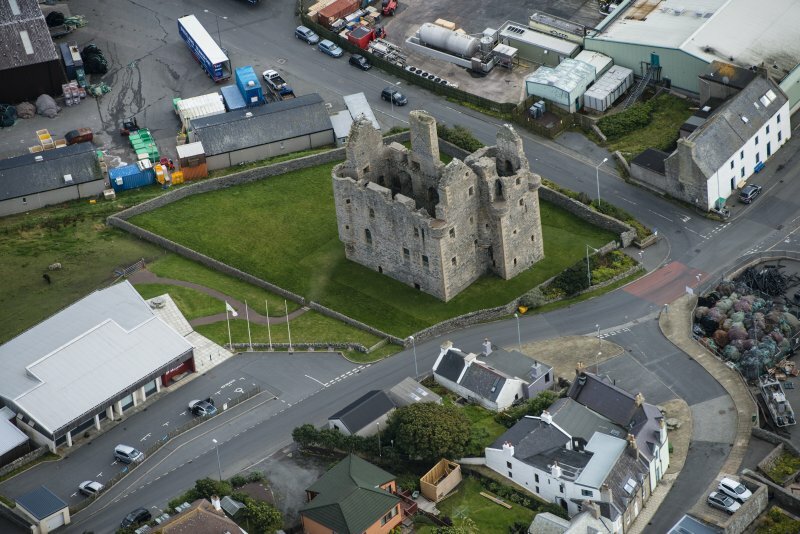 The basic design of this castle consists of a rectangular main block, some 18m by 10m, with a 8m square tower at its south-west angle. 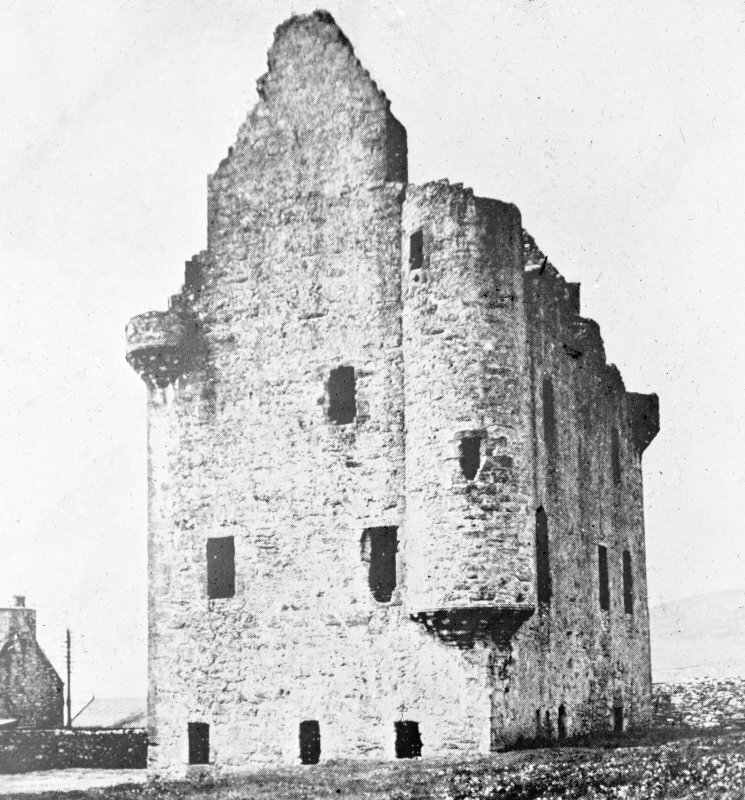 It has four storeys and an attic, and turrets at each corner, and it is intact apart from the roof and the two uppermost floors. 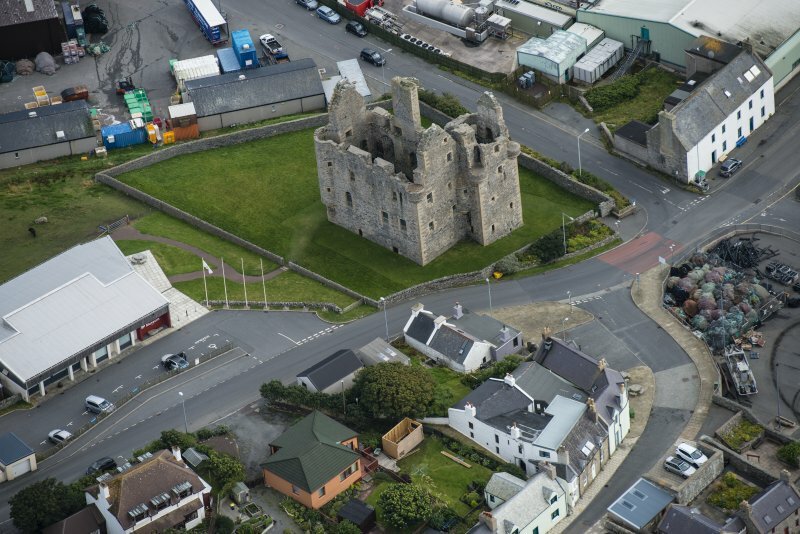 The entrance is sited in the tower, strategically close to the angle with the main block, and it is covered by a circular gun-loop at ground-floor level in the tower. Many if not all of the windows were originally furnished with gunloops, but there has been much alteration. Surviving in the window-sills of the second floor of the main block are quatrefoil gun-loops, while there are circular gun-loops in the north-east turret. 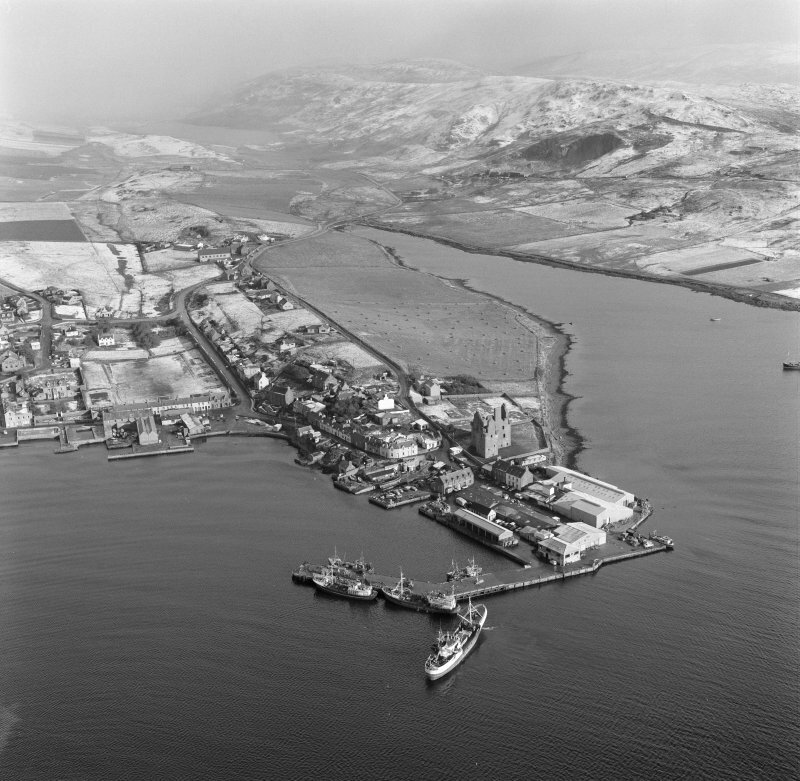 Both types were also used at Muness. The doorway would have looked splendid when the carved panels above it were intact. At the top there is a weathered armorial panel, and the empty double panel below may also have held armorial carvings. It has been suggested that the double panel held the arms of Patrick Stewart and his wife, with the royal arms above. The bottom panel was carved with an inscription, now so worn as to be barely discernable, but fortunately it was recorded in the 18th century. 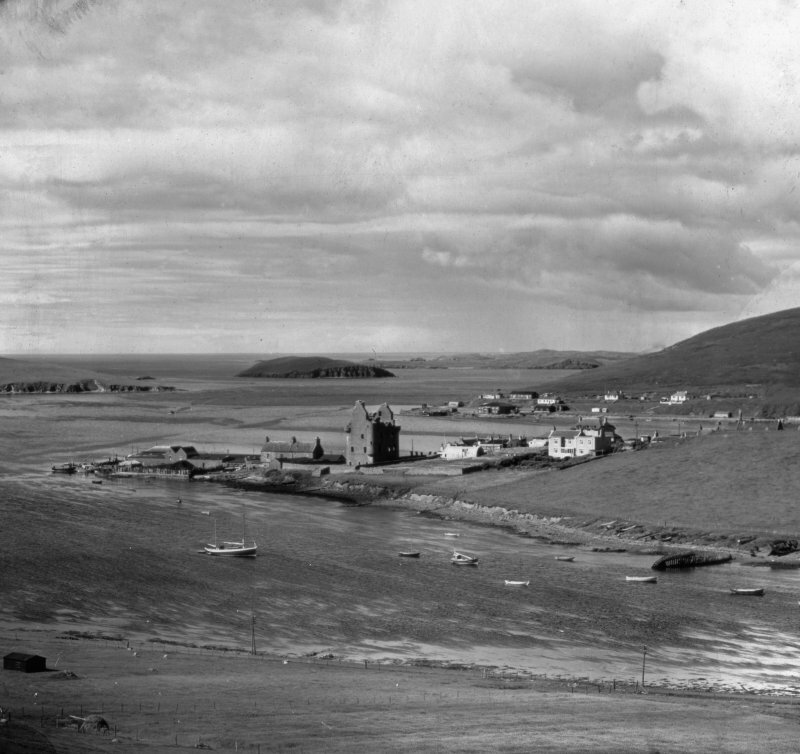 It read 'Patrick Stewart Earl of Orkney and Shetland/James V King of Scots/That house whose foundation is on a rock will stand/but if on sand it shall fall/AD 1600'. 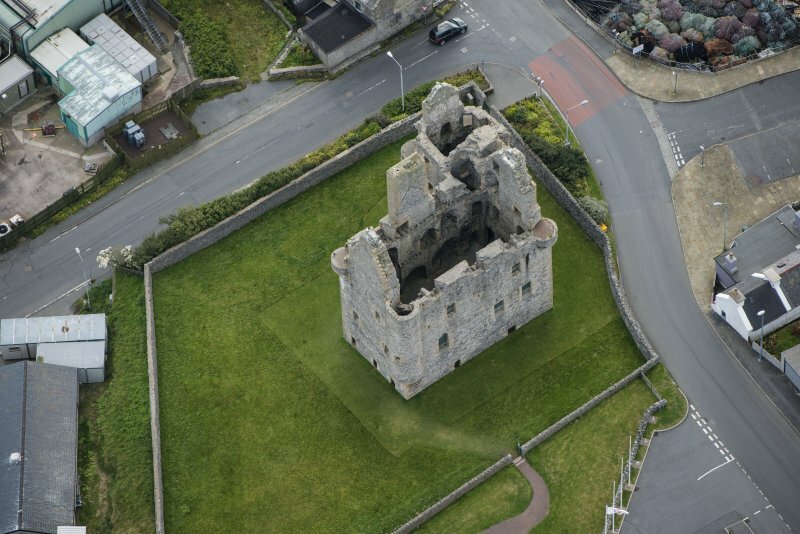 There has been much speculation about the meaning of this enigmatic statement about foundations, but it is possible that it should simply be taken at face value, as a reflection on the strong foundations of the castle and the strength of the family that built it. 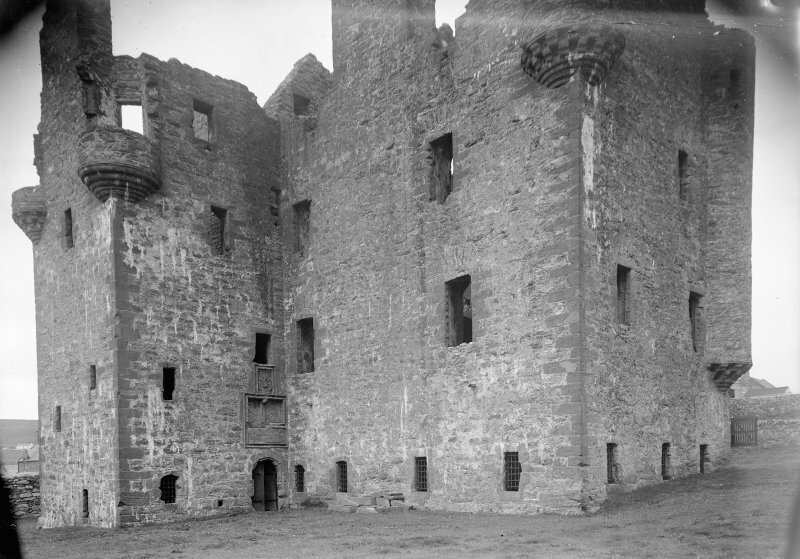 The tower is mostly taken up by the stairway and landings, and the major rooms are in the main block. On the ground floor is a large kitchen with a massive fireplace and well, together with a storeroom. 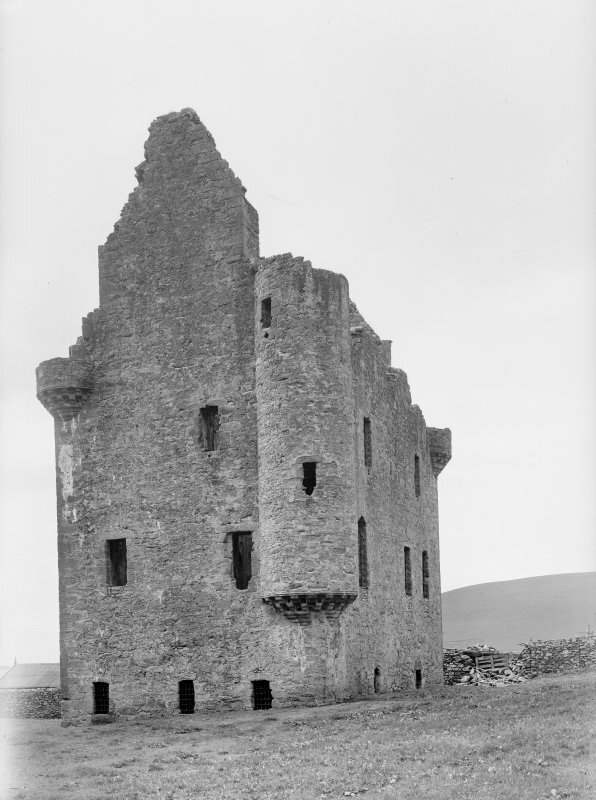 The whole of the floor above is taken up by a spacious hall served by nine windows and two fire places. 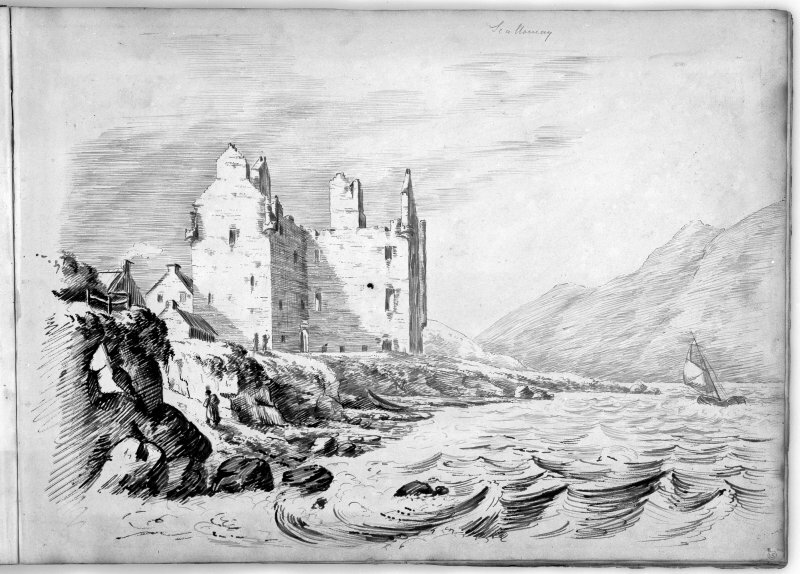 An account of the ruined castle written in 1701 mentions decorative wall paintings and suggests that the great hall may have been a colourful and sumptuous sight in its heyday. 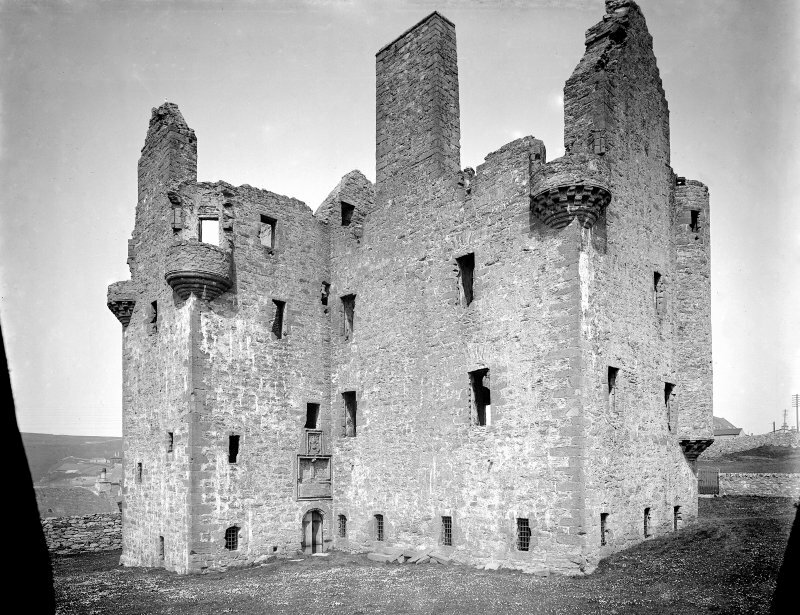 The upper floors were divided into private apartments, and there were also small rooms on the upper floors of the tower and in the turrets. 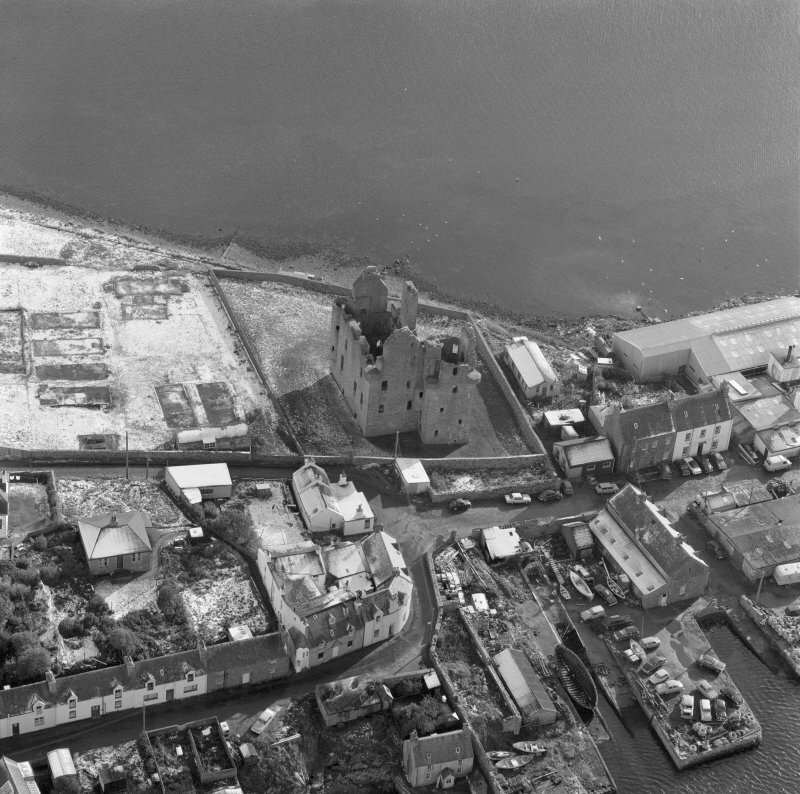 The castle was a major building project for Earl Patrick in 1600, but it seems unlikely that he spent much time there. 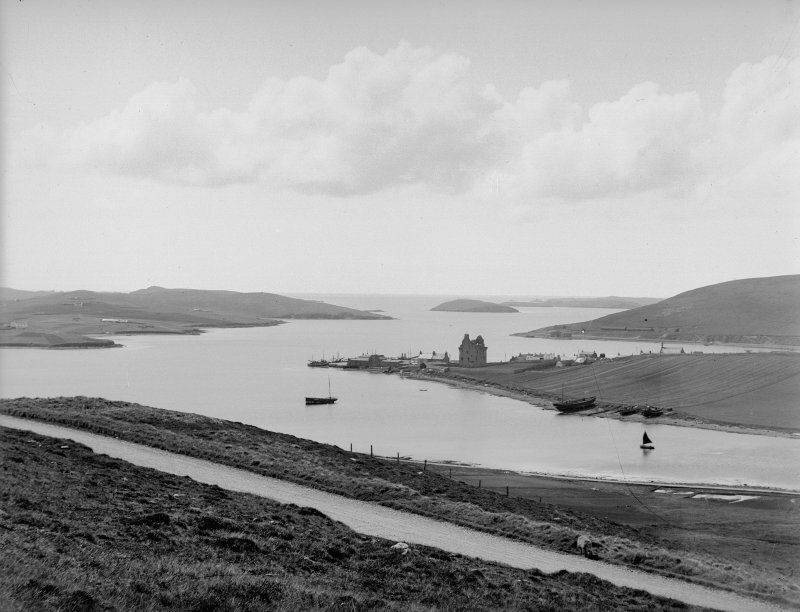 His rule in Shetland was very harsh and led to his arrest in 1609, when he was taken to Edinburgh. 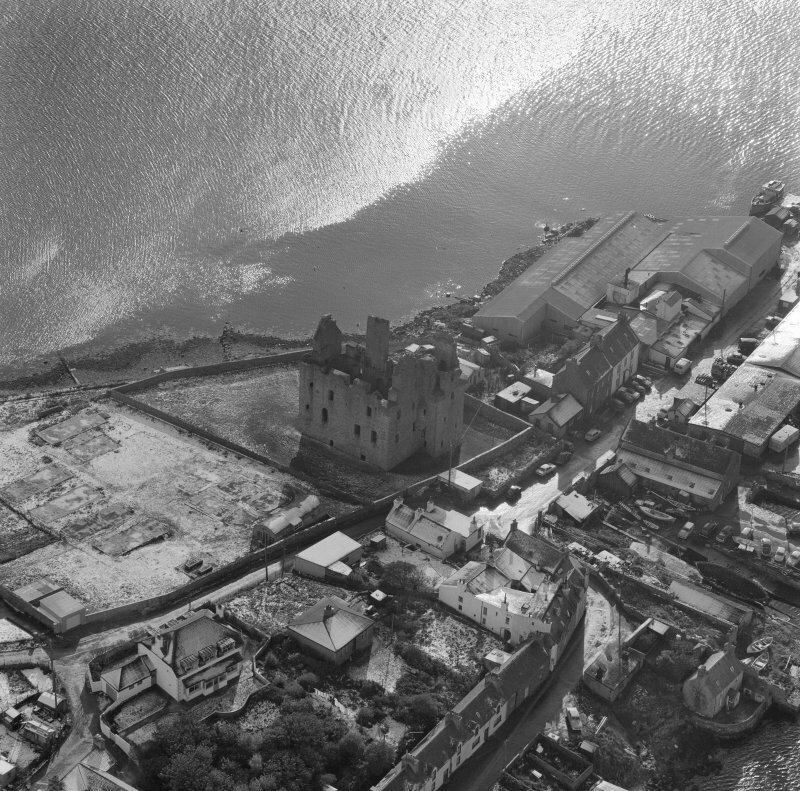 His son Robert attempted to restore the family fortunes by instigating a rebellion, but it failed and both he and his father were executed in Edinburgh in 1615. 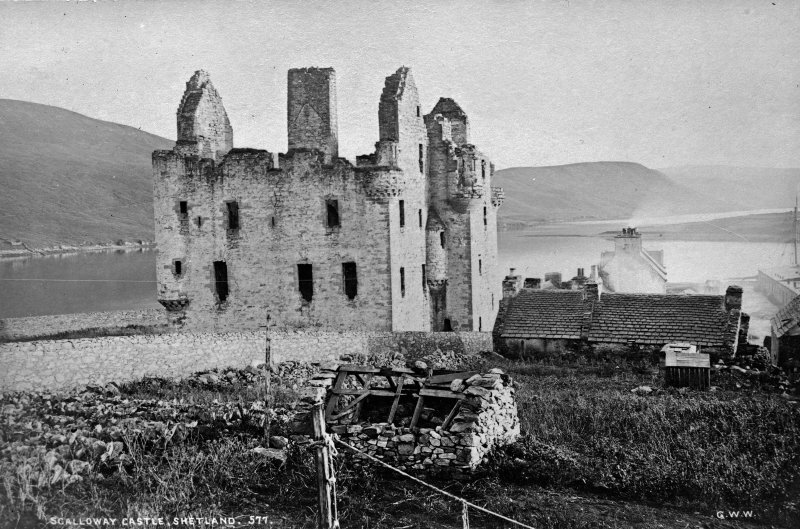 Apart from a brief period of garrison by Cromwellian troops in the mid 17th century, the castle was left to fall into disrepair, though admired by visitors, until it was taken into State care in 1908.